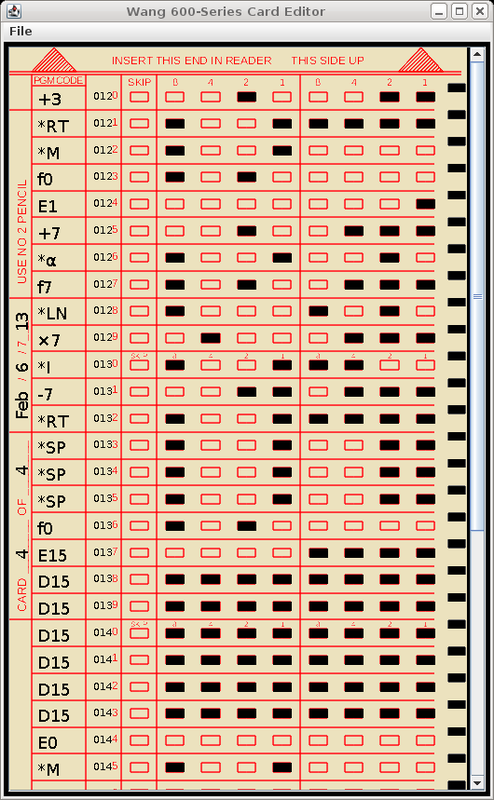 This simulator actually runs a microcode image extracted from a real Wang 600. 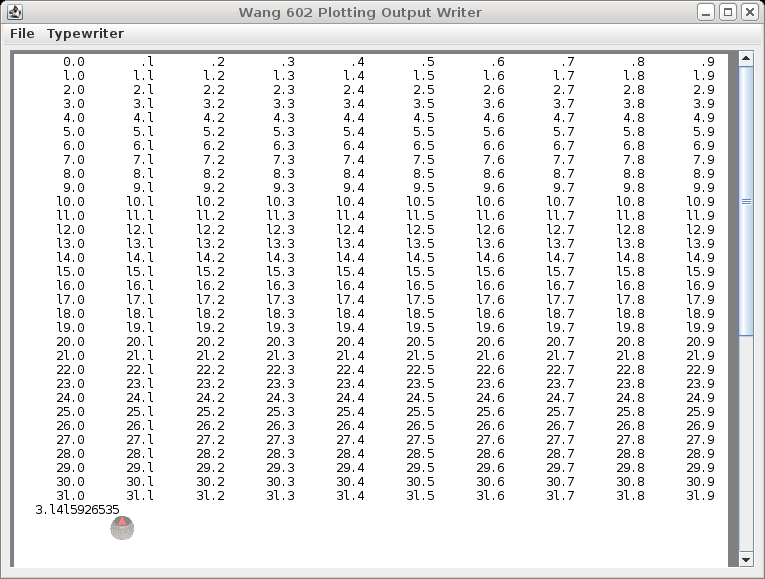 Since it is a hardware simulator running real microcode, it can be used to discover and understand the behavior of the original Wang 600's (up to the limitations of the hardware simulation). These devices are controlled through the "Devices" menu. Additional information can be found in the Help topic "About the Simulator". Online help is provided through the "Help" menu. 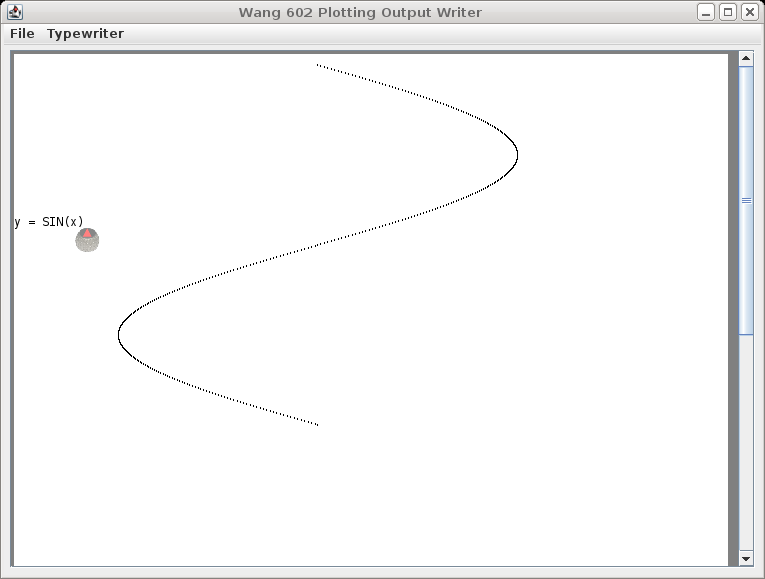 This includes help running in the simulator environment as well as standard operation and programming of the Wang 600. Printed output (builtin or OutputWriter) appears in separate, dedicated, windows. A menu on the window provides for Printing (to a real printer), Saving to a file, and "Tearing Off" (clearing window). Special thanks to Rick Bensene, The Old Calculator Museum, for help and materials to make the simulator more realistic. 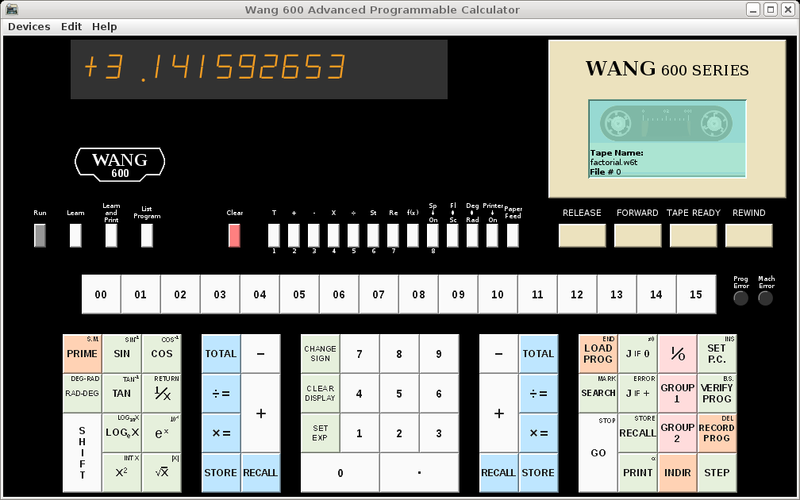 Also see Alf Urban's Wang 600 Emulator. Dedicated to Harold "Pepper" Roberts, my high school computer instructor, who fought to keep, maintain, and upgrade what was, at the time, a very expensive piece of equipment for a high school to own. As this is my first Java project, and is still evolving, it may not operate to everyone's satisfaction and I make no claims or guarantees about it's usefullness or suitability for any given purpose. It is not known to be destructive in any way, however since it does allow the user to create files there is a possibility of data loss if unintended files are overwritten. 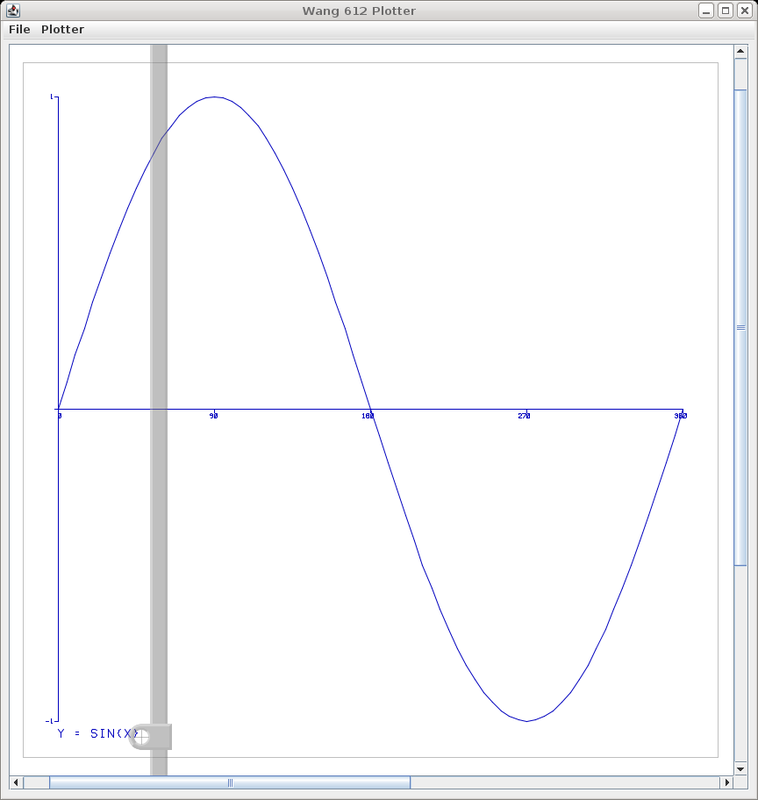 This software is provided free of charge, including the source code. It may be modified and redistributed provided no fees are charged, original copyright notices are retained, and modifications are submitted back to the author. Pre-built packages may be installed according to the platform. Note, this project is written entirely in JAVA, so it is likely that the provided JAR file will run on other platforms (provided the java VM is compatible). The source may be built by unpacking the w600-sim.tgz archive (creates subdirectories "w600-sim" and "common"), changing directory to "./w600-sim", and typing "make". The simulator can be run from that directory using the command "java w600_fe". Or you can type "make install" to install into a "wang600apc" subdirectory in your home directory, which also runs the INSTALL script from there to create the "Wang600Files" folder and sample programs. Then the simulator can be run the same as for the pre-built packages (use the "run" script). The simulator may be run in a "debug" mode by adding the "-i" option to the start command (there must be a "terminal window" kept open in order to use the debugger). In this mode, the simulator is run interactively and may be used to trace and otherwise examine the state of the "machine". Pressing '%' in the calculator window will cause a "%" prompt to appear in the terminal window. Type "go" to resume the calculator and GUI. Other commands are shown by the "help" command. The command "quit" will end the simulation (and the GUI).